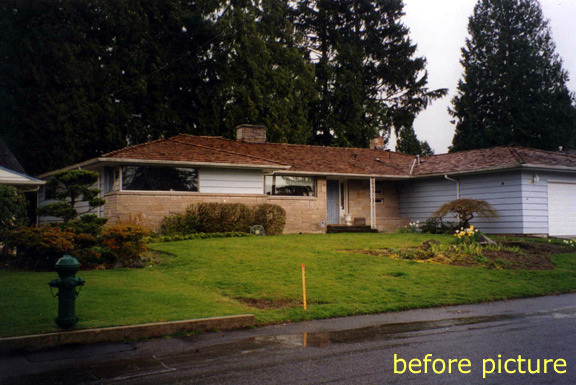 Located on the western edge of the Sandpoint Country Club in Seattle, this low, ranch-style home encompasses two distinctly different landscapes linked visually by a see-through entry hall: a front garden facing a residential street and a back garden opening onto the expansive lawns of a golfcourse. 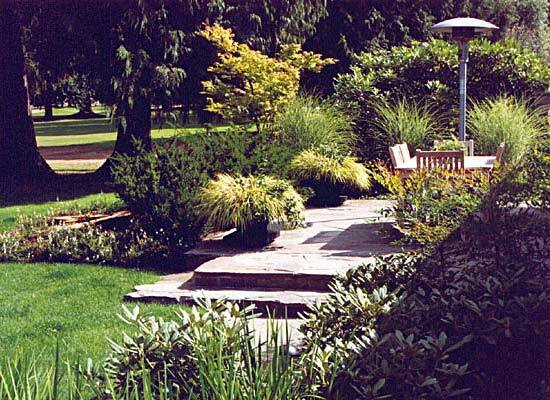 When the owner undertook a major remodel of the house, Seattle Landscape Architects Talley & Kolb were brought in to harmonize the front garden with the clean, modern feel of the house and to create a usable back garden with plenty of room for seating. 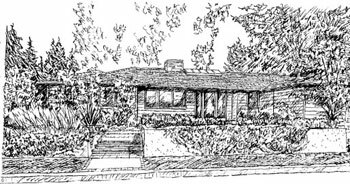 Both spaces are semi-private in spirit, with minimal screening of the neighboring properties. The new front garden is distinguished by a long, low concrete retaining wall and wide stone steps separating a front entry terrace from the street. Interlocking with a small, L-shaped lawn, the terrace is constructed of rectangular concrete panels bordered by bluestone bands and is appointed with stone benches. 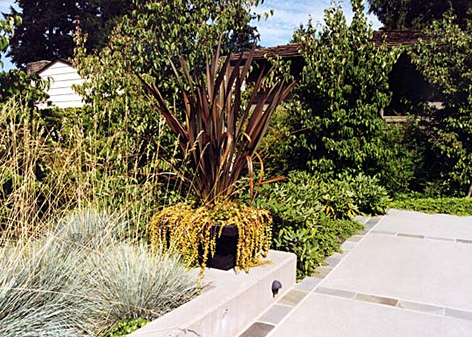 Dramatically planted cast stone pots reminiscent of Frank Lloyd Wright’s Prairie style featuring mark the entry to the garden and flank a raised porch at an alcove by the front door. A dense grove of Korean Dogwood trees on the north side of the garden contrasts with the umbrella-like canopies of three Mount Fuji Cherries flanking the driveway. 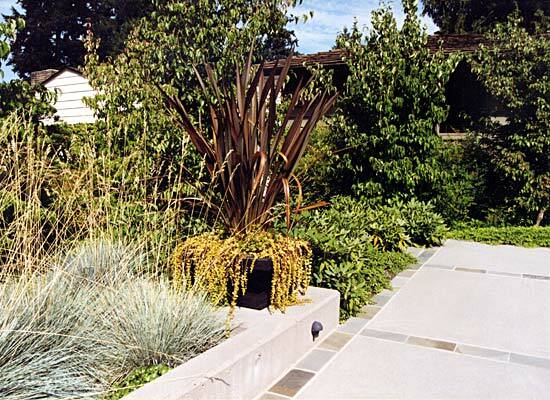 Mixed plantings of ornamental grasses and evergreen shrubs border the terrace and frame the main entry to the house. Marked by two large, bluestone seating terraces, the back garden takes maximum advantage of the golf course, its turf rolling right up to the stone path. A “living room” terrace is located directly off the main hall and a “dining room” terrace with a large table and chairs opens out from the indoor dining room, continuing and repeating the use of the living spaces within the house. 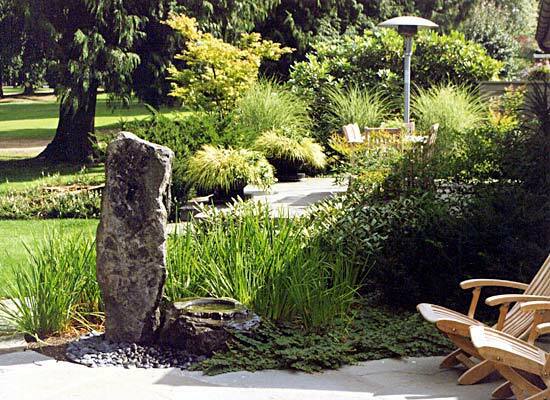 The center of the garden, just opposite the main back doors of the house, is punctuated by a simple water feature comprised of a column of pillar basalt which drops water into a stone basin placed on a bed of rounded river rock.